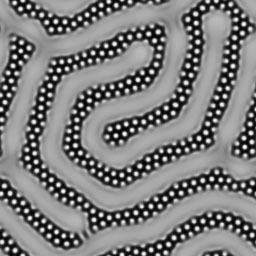 On the chemical basis for morphogenesis, Turing structures, in some sense, shed light on How does the leopard get its spots? We focus on interacting Turing modes. 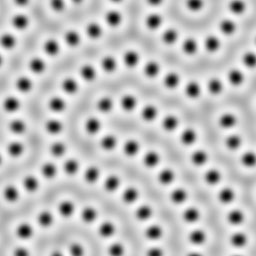 The chlorite-iodide-malonic acid (CIMA) reaction exhibits an interesting Turing pattern, black-eye, where the black center (high concentration of iodide) is surrounded by a white ring(low concentration of iodide), and these eye-like spots arranged into a hexagonal lattice. [G. H. Gunaratne, Q. Ouyang, and H. L. Swinney, Phys. Rev. E 50, 2802 (1994)]. A subsequent study[M. G. Gomes, Phys. Rev. 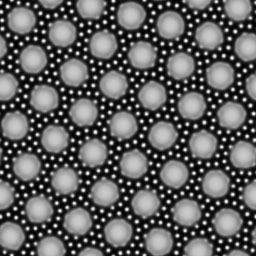 E 60, 3741 (1999)] suggested that black-eye patterns are not two-dimensional,but rather projections of a three-dimensional body-centered cubic lattice. Recent experimental results suggest that the three-dimensional interpretation is not appropriate[C. Zhou, H. Guo, and Q. Ouyang, Phys. Rev. 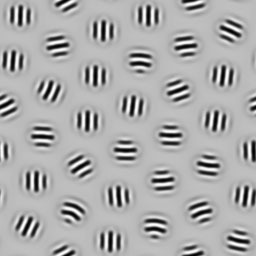 E 65, 036118 (2002)], but to date no model has been developed that reproduces the black-eye patterns in two dimensions. We propose a model that generates not only black-eye patterns but also a variety of other spatial resonant patterns: “black eye”, “white-eye”, and “Twinkling-eye” resulting from interactions between different Turing modes, or between a single mode and its harmonics. 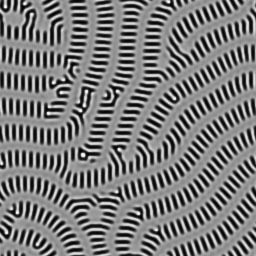 Also, we obtained superposition patterns with different combination of stripe- and spot- Turing patterns. 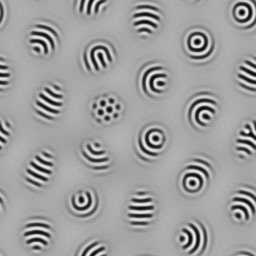 This work appears in Phys. Rev. Lett. 88, 208303 ( 2002). Our results provide a possible mechanism not only for the recent experimental observation of ¡¡lack eye?patterns, but may also provide insights into the chemical basis of morphogenesis.